Women of NASA lego is the new LEGO Ideas Women of NASA set is available! When you’re shopping for toys, finding educational toys that cater to both genders can be frustrating. There’s certainly no shortage of science and construction toys. However, oftentimes toys are marketed toward girls in stereotypical ways. LEGO is looking to change that. This fantastic new NASA Lego set was just released November 1st. This is a 231-piece set which pays tribute to some of the incredible NASA women scientists. These women made history in math, science, engineering and space travel. 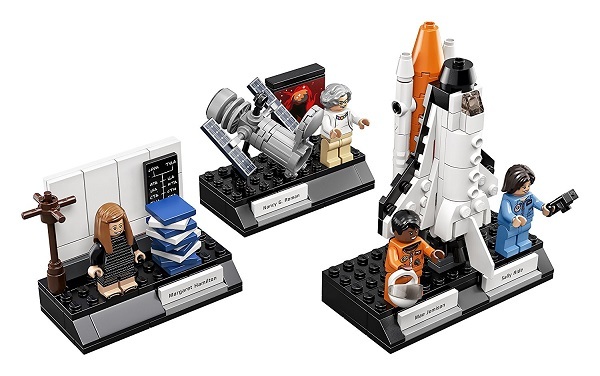 What’s fantastic is that Lego put all of them in one set, so kids can enjoy learning about all of these incredible NASA professionals and don’t have to buy them each separately. There are four minifigures in this set. Sally Ride was the first American woman in space, but this isn’t the only way she was revolutionary. At just 32 years of age, she was also the youngest American astronaut to travel in space, a record that still stands today. Her gender made her a controversial pick for NASA’s Challenger task force. As a result, she dealt with countless absurd questions and comments that no doubt prompted some eye rolls. These included suggestions that the flight would affect her reproductive organs and that she would cry if things went wrong. She pointed out that the other astronauts weren’t asked these questions. According to Sally’s mother, there were a lot of people waiting for her to fail. However, Sally rose to every challenge. After working with NASA, she went on to become a physics professor. Later, she founded her own non-profit organization to promote science, engineering, math and STEM education to young people in the USA. It’s called the Sally Ride Science organization. LEGO made another great pick with Nancy Grace Roman. She was NASA’s very first Chief of Astronomy, and the first woman to hold an executive position at NASA. Her role involved overseeing the planning and development of the Hubble Space Telescope. Various organizations have recognized Nancy’s work. In 1962, she won a Federal Women’s Award. Life magazine named her one of the most important young people. In 1969, NASA awarded her the Exceptional Scientific Achievement Medal. There’s even an asteroid in her honor, so it’s fitting that there’s now a LEGO character, too. Dr. Mae Jemison was the first African American woman in space, and is a hugely inspirational figure. Her character in the LEGO set has the same famous orange space suit she wore. In 1992, she boarded the Endeavor Space Shuttle and made history. She became an icon for young African American girls everywhere. She’s so much more than an astronaut, though. She completed a degree in chemical engineering and a doctorate in medicine. Plus, she racked up countless awards throughout her career. This includes a seat in the International Space Hall of Fame. She started out in the Peace Corps. After her success with NASA, she resigned to pursue her interests in technology and social science. Then, she founded her own company, the Jemison Group. Jemison has worked tirelessly to inspire young people to take up science and technology, with a particular focus on minorities. Outside of that, she was an actress, dancer and choreographer. In the 1990’s, she appeared in episodes of Star Trek. Is there anything she can’t do? This LEGO set will help to continue to inspire a new generation. Margaret Hamilton was the lead software designer for Apollo 11. It was partly due to her work to develop and test the Apollo software that the mission was successful. If it hadn’t been for her work, the moon landing would have aborted. Just three minutes before the Lunar Lander reached the moon, the computer overloaded. The software she helped to develop was able to recognize the problem and go into recovery mode. The moon landing was successful. Hamilton earned the Presidential Medal of Freedom. NASA also gave her a special award, including the largest financial award they’d ever given to an individual. The most astonishing photo taken of her shows her next to books full of pages of code that she’d written, stacked up as tall as her. LEGO’s Margaret Hamilton character bears the same long hair and glasses you can see in that photo. Here’s one of their retired sets that was a big leap in the right direction. Surprisingly, Katherine Johnson is not part of this LEGO set. Katherine Johnson’s incredible mind was integral to some of NASA’s biggest missions. A genius mathematician, she was able to calculate trajectories and launch windows for space shuttles. Can you imagine if the Apollo 11 flight to the moon had never taken place? Without her, it might not have. Katherine has received a long list of awards and honors for her astonishing work. However, by far the most prestigious award she received is the Presidential Medal of Freedom, which Barack Obama gave to her in 2015. In 2016, she was featured in Hidden Figures. This film told the previously little-known story of NASA’s African-American female mathematicians. The film’s release was a great step in putting NASA’s previously unsung heroines into the spotlight. This set is a welcome extension to some previous LEGO sets, which included female scientist figures. Those sets featured female LEGO characters in a STEM career, instead of the usual shopping, hair salon, or pet store scene. These LEGO female mini-figures included a chemist, an astronomer, an inventor and a paleontologist. However, LEGO made them limited edition sets. Unfortunately, they sold out quickly. Here comes LEGO again, with an effort to represent female NASA role models. These Lego sets will feature revolutionary women leaders from NASA. These will give kids a chance to enjoy engineering toys in a new way. LEGO has many sets that focus on space, some include female minifigures as well. This new set will solely feature the NASA hero. LEGO creates great developmental toys, helping to boost fine motor skills, imagination and creativity. Now they will be help children to learn about STEM careers too. As well as LEGO sets, there are plenty of other great educational toys for your child to play and learn from. If you’re into space-themed toys, be sure to check out the Space Rail marble roller coasters. These are great STEM toys that focus on fine motor skills and attention to detail. What’s great is that as kids advance their skills, you can buy more difficult sets, much like more advanced LEGO sets with thousands of pieces. We are excited to try this new Women of NASA LEGO Ideas set. We love that LEGO chose to feature women NASA heroes. Again, it’s awesome that kids will enjoy playing with all four mini-figures in one set with 231 pieces. We want to teach our children — girls and boys — that they can accomplish anything.